my Nick's Largo and I am playing Epic for quite a while now. Till now I have only read on the forum here, because there is a german forum (yeah, I am another german player) and I think it's a very good one. 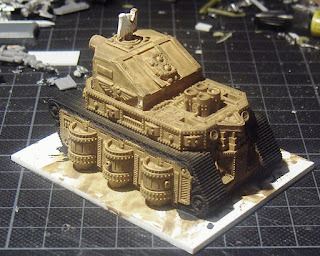 But since Black Legion asked me kindly on the tourney in April to post pictures of my army on Taccom, and I had nothing better to do this evening, I thought I might give it a shot. Last edited by Largo_W on Sun Jan 15, 2012 5:54 pm, edited 1 time in total. 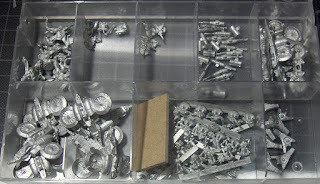 Very nice army and welcome to the forums! I hope you will share more photos of your Epic stuff? Me love German Largo long time! great!! the paintwork is very nice and clear!! awesome ! Very nice armies, that rocket launchbay reminded me of the GLA Scud Launcher even before I read your text, nice work! And then there was the weekend. And also an update. Thought I put out my paints since it was raining at evening anyway. So I finished up all the infantry for one Tactical Detachment and a Dread. And I only painted about 4 hours Neat! And I also did Sgt. Paint test for the Necs. I wanted them to have the same theme than my 40K necs. I am still rather nhappy with them. Any criticism or advice on them? The "big" warrior is black/regal blue/regal and ultra and the small immortals are black/ultra/enchanted blue and white. Any comments? This "blog" is covered in multiple layers of dust and I want to change this. I tried several forms of blogging so far, including facebook (evil piece straight from hell, never ever shall I step there again), twitter (commentwise bad) and in forums like this. The problem with forums is simple: No person is registered in only one forum, I for example also use the German Epic-Battles.de Forum more often since it's my native language. I recently started to use a normal blog (Zinngebirge, Leadmountains in English) on Blogger and I am very happy with it, editing wise. You are far more powerful when it comes to editing and the functionality for embedding pictures are great. But, and that's the downside, you have to be a registered member on Blogger, Google or a couple of other services to write comment. Most wargamers I know and who are reading my blog, meet me personally and tell me there thoughts then on occasion. I am currently scratching an insert for the Sovereign Class Land Ship (Dystopian Wars, Spartan Games) for using it as a Leviathan. The basic structure is done, next up are details. Very nicely done ... like the mix of models too !!! 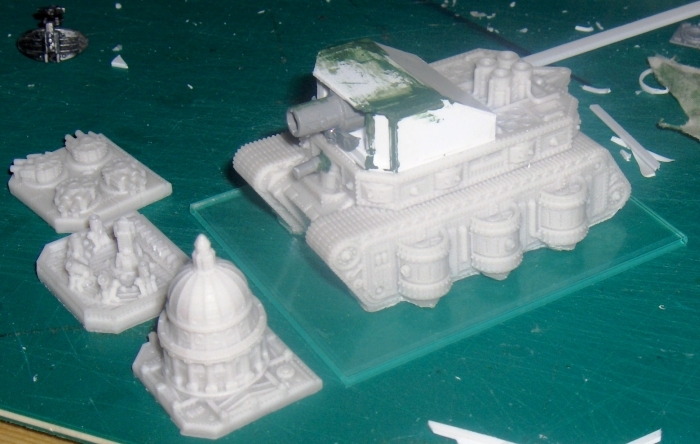 When you post converted super heavies could you state base size or hull length so we can get an idea of size? I will do that when I am finished. I am planning to do comparision shots with an AOT and an old E40K Rhino, too. I also use a Sovereign Land Ship as my Leviathan, great model at great price. But, what really impressed me is your C&C GLA army. 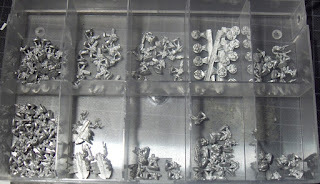 I would like to have such an army because I love the C&C generals theme, your conversions are just brilliant!!!! Leviathan looks great. Cant wait to see the finished beauty. I see where you're going. When I saw the Spartan games dystopian line of mini's I just had to start a squat army full of WE-goodness. I'm using the sovereign also as a common chassis for the Colossus and Leviathan. 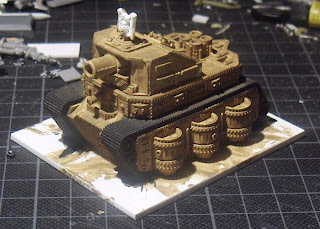 Still thinking if the prussian big landship (can't remember the name) wouldn't pass better for the cyclops..
Great work on the conversion! Update on the Leviathan. Please note that these are just basic concept colours.